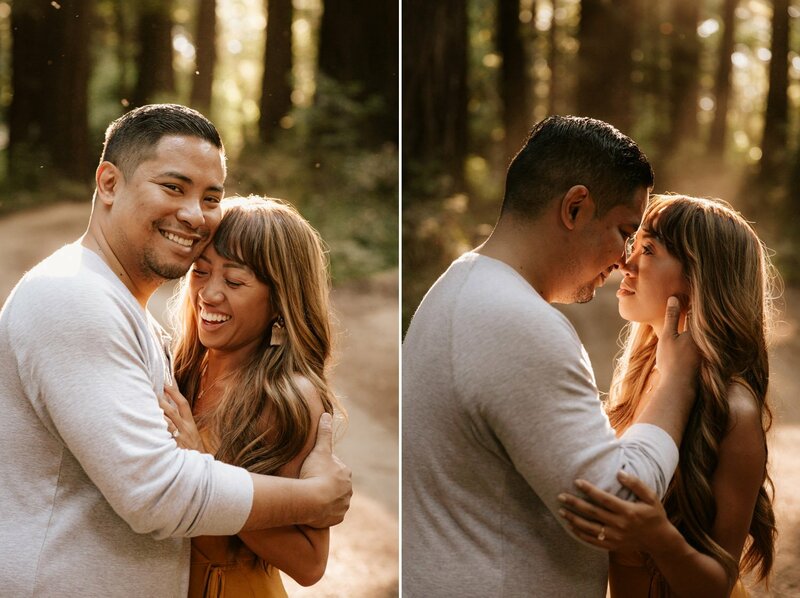 Maria and Darren met me in Big Sur for an incredible day exploring the redwood forest and golden beaches of the Central Coast. It makes my heart so happy when my couples travel the extra mile and turn their engagement session into an experience they’ll never forget. Big Sur never fails to impress me or my couples with its magic atmosphere. 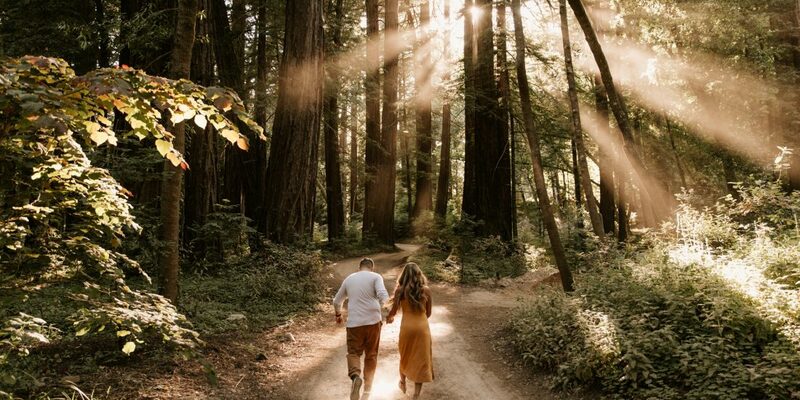 After a scenic drive down Highway 1, we made it to one of my favorite redwood groves in time for golden hour. The winding trail led us to a grassy meadow, full of colorful blooming flowers and berries. We frolicked in the soft grass, then made our way down to the Big Sur River. Maria and Darren picked stones from the riverbed, laughing as they skipped across the water. As the light waned, we chased rays of light poking their angel fingers through the forest canopy. We eventually came to a dirt path with a stunning background of redwoods. Maria and Darren were slightly ahead of me, unknowingly kicking up dust as they walked. The dust rose and subtly illuminated the rays, then disappeared in an instant. I beamed with excitement when I saw this. I encouraged them to run up and down the trail together, kicking up as much dust as possible. My plan worked and the most magnificent rays I’ve ever seen lingered over our heads. We ended our forest exploration on a high note and headed for the coast. We piled back into the car and headed north on Highway 1. I can personally attest that no turnout is a “bad” turnout on this drive. You’re greeted with something to “ooh” and “ahh” over around every turn. Maria and Darren changed outfits in the car, then we stopped at a random turn out with a great view of the Point Sur Lighthouse. The wind was insane compared to the calm in the forest. It ripped at our hair and our clothes as we stood at the edge of the cliff overlooking the water. We grabbed some scenic shots, then sprinted back across the road to the safety of the car. Since Maria and Darren were newbies to Big Sur, I thought a stop at Bixby Bridge seemed appropriate. The iconic bridge is always crowded with tourists in the summer time and the lot was overflowing. A gut impulse beckoned me to keep driving down the dirt road. The narrow mountain road came to a turn and gave us a beautiful view of Bixby from a distance. It might even be my new favorite way to experience this landmark. By now, the light was peaking along the coast. Our last stop of the evening was the hidden lily valley and sandy beach of Garrapata. The sunset light cast a warm orange hue over the coastline and rolling waves. Maria’s white dress billowed behind her as we ran up and down the sandy beach. We had the entire place to ourselves. 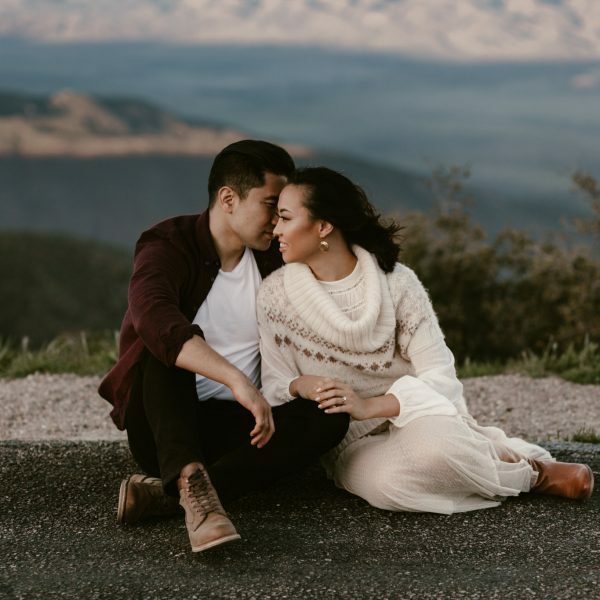 We were giddy over the beautiful landscapes and perfect weather for their session. It was hard to leave the beach as the light faded, but grumbling bellies and tired legs finally pulled us away. Reflecting back on this day makes me so happy. 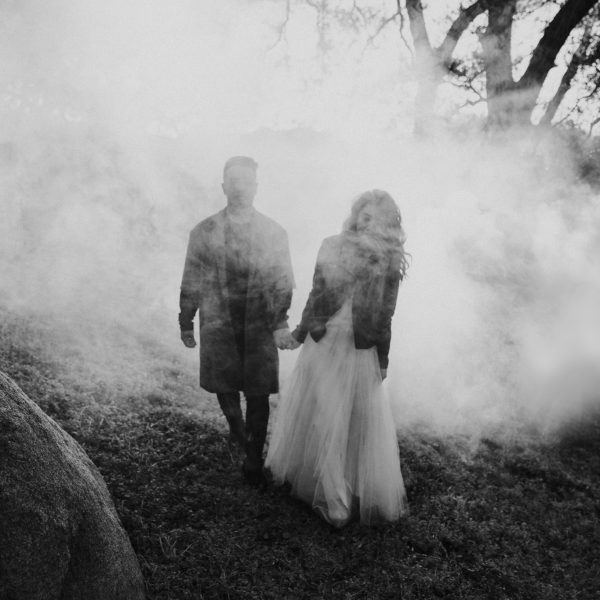 I am over the moon to photograph Maria & Darren’s wedding in just a few short days! Congrats you two, can’t wait to create more magic together! 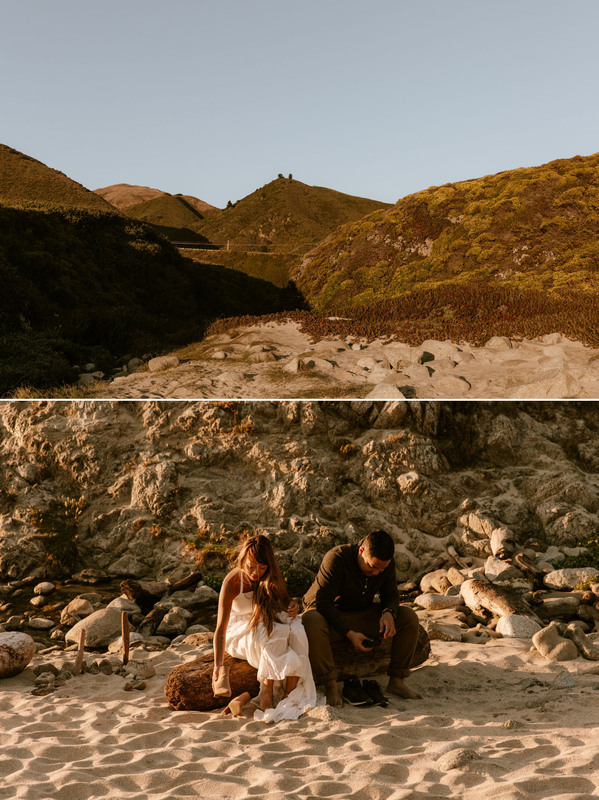 If you loved this session, check out Jessica & Paul’s intimate wedding in Big Sur or Julianne & Mason’s Point Lobos engagement in Carmel!